No Hunger Weight Loss by Mission Thin Possible. Every member of MTP who has been attending our program regularly has now achieved their slow steady weight loss or at minimum turned previous weight gain into a steady loss trend. 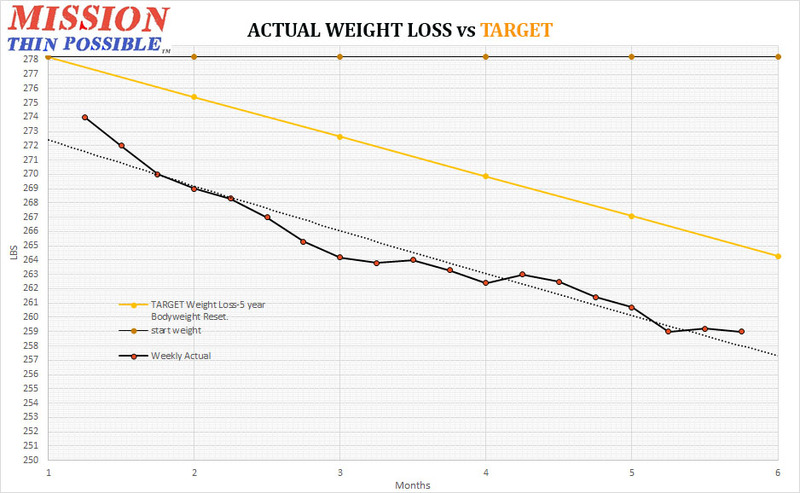 We can now reset your target curves to better provide you a clear picture for your continuation phase. It is not time to let up now. What do you think you have done in your lifestyle that had the most effect in producing this result ? Take time to reflect on what you have been doing. Have you committed all you can to changing your lifestyle to live healthier and live longer. Have you done what you can to interact with and spread the benefits of your new lifestyle. What can you do to achieve more. Come back next week and tell us what more you have changed. Exercising hard is not necessary nor is it an effective tool for permanent weight loss. Low to moderate intensity exercise however has all the benefits that are needed to achieve living longer. Health professionals all agree that including exercise as part of a “lifestyle change weight loss program” gives fives times the probability of success. Walking was the exercise program adopted by over 90% of people who have ever successfully achieved permanent weight loss. Walking can be added by almost everyone to your own schedule instead of changing your schedule to fit in a gym,cardio, or dance class program schedule. You can adopt as many small sessions as you want broken up throughout the day, before work, at lunchtime, after work, alone or walk with friends, family,children, and pets. Walking is the most readily available and least costly program that anyone can use to achieve a permanent life change. • Wear comfortable walking shoes, with good fit and low heel. • Choose a safe, well lit route especially if walking alone. (Ideally always walk with an exercise buddy). Most people like to challenge themselves. Using a pedometer to track your daily step count will motivate you to walk further and you will see your progress. Setting yourself a step goal for each day will push you to do a little bit more until you eventually hit your step goal. Walk with friends and plan scheduled walking dates to encourage you to walk more often and regularly. How To Reach 10,000 Steps a Day? 10,000 steps a day is a good daily target to set as a goal. If you have a desk job 10,000 steps may seem daunting. A daily step count target can start at less than 2,000 steps. Follow this guide to steadily build up your step count. •Step 1: Determine how many steps you take in a normal day by wearing a pedometer for 3 days. •Step 2: Calculate your base line, divide total number of steps by the number of days measured. •Step 3: Read your first goal from Col B. that corresponds to your starting baseline. Cols C and D give recommendations for reasonable rates of step increase and time to increase. •Step 4: Circle the number of steps on the Step Table closest to your ultimate goal, 10,000 for most people. •Step 5: After you reach your first goal set that number of steps as a new baseline and repeat the cycle. If you find you do not have time to add more steps focus on going faster and or including more hills. These Pre-emptive action suggestions will help you increase your daily step count. •Put on your pedometer immediately you get dressed in the morning – every step counts. •Have a quick walk before work, use the time to plan out your day. •Check your step count during the day, do not leave a large amount to make up after work. •Get up and walk periodically during the day. Plan to have half your days total done by 3 pm. •Wherever you are going, take the long way round and use the stairs! •When grocery shopping walk around every aisle. •Make a walking date with a friend instead of calling them on the phone, window shopping will easily add 2000 steps to your step count . Buy a pedometer if you do not have one. Start your 10,000 steps a day walking target. Use the guide above to increase your step count. Call a buddy and invite them to walk with you! Enjoy the walk. Intend to Exercise, then do it ! I started writing this blog as “Making time for exercise”, but stalled with the thought that if we do not have a true “intention” to exercise, all of our plans and wish lists fall by the wayside because we will not follow through on them. I questioned myself how do I do it? To set in my mind a true intention to exercise, I must mentally pre-program myself, so I see it happening and set it in my mind and commit myself to it. Once I have done that my next step is to plan and decide on the time and place and the how and record it, write it down, text someone my intent. Better still I invite a buddy along as an extra driving force as insurance. Exercising for 20 minutes a day will add to your longevity. Adding 20 minutes of light exercise a day adds up to 2+ hours of exercise a week this has benefits not only for burning calories but in increasing our body’s overall health and agility. Plan time for exercise and make it a regular daily routine habit is even better. It helps to exercise around the same time each day. The key is to build exercise into your life style so that it is not disruptive. Chose times of the day that work best for you. Is it early morning before work or just before supper? or while watching TV? Use those 5-minute advertising sections to put in some body strengthening exercises like squats and lunges. My father, now 93 years old, swears by the arm curls with a couple of cans of beans he has practiced over the years since retirement while watching T.V. as a major reason for his good health. Start with something simple, Walking is the simplest exercise, it costs nothing to get started. It is easy, safe and can be done anywhere and anytime. Walk around the block in your neighborhood, around the local parks, meet the neighbors. Walk to the corner store instead of driving, walk in the sunlight and get the bonus effect of melatonin stimulation to aid in better quality sleep. Even at home you can move more through some simple changes to regular household duties, get creative and involve the whole family. Work in the garden, mow the grass. Rake leaves, prune, dig and pick up trash. Stand up while talking on the telephone and exercise on the spot –try high leg lifts , high knee bends or lunges. Walk the dog or borrow the neighbors’ dog and take it for a walk. Plan family time for exercise involve the kids or other family members, make it a friendly playful competition- volleyball before dinner or simple catching a ball. if you are lucky enough to have home exercise equipment intend to use it, make yourself a schedule. 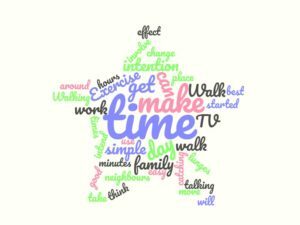 If you think you don’t have the time to take a walk, think about how much time you spend after work on the following activities- watching TV, binge watching TV shows on Netflix, catching up on your social media accounts, talking about how tired you are. Can you change some of the couch potato time into exercise time? Make the change today, intend to move more, then actually do it! Plan and intend to complete 20 minutes exercise in your daily routine. Keep track of your activity for one week and let us know how you did. It can be challenging to eat more vegetables than the one serving we have with our main meal of the day. If we are eating to meet dietary recommendations, we have to find ways to get up to 5 servings of vegetables into our diet every day. There are many ways to do this, but it takes preparation and planning. We have already made the commitment to eating foods that are healthier and have more fiber, eating vegetables is the best way to achieve this. It comes down to planning and pre-preparation. Grocery shopping should be done on a day when you have an extra half hour to wash and prepare the vegetables that you have bought. Having a container of pre-washed broccoli, carrots, celery, cauliflower, cucumber, peppers and tomatoes in the refrigerator gives you so many more options to add vegetables to every meal. You are ready to get creative like adding chopped vegetables to your pasta sauces, if you get objections from family members because they can see the vegetables, use a blender and blitz the vegetable before you add them so that they blend into the sauce. Make soups. A truly rich vegetable soup can use up all the odds and ends left over at the end of the week with the addition of some shredded cabbage or fresh herbs. If you feel you do not have time to make soup, again blitz the vegetable first in a blender and the soup will cook much quicker. Add beans like black beans or chick peas for added fiber. Serve vegetables and dip as a starter before every meal, stick to low calorie dressings or hummus or make them yourself e.g.- parmesan cheese, pressed garlic and lite mayonnaise. Find the flavours that suit your family. Have one day a week which is a meatless main meal such as a veggie chili using 3 types of beans such as kidney beans, black beans and chick peas or a Veggie lasagna made with auberge and tomatoes. Get creative with baking – substitute shredded vegetables for fruit in muffins, use whole grain flour and shredded carrot in cake. Fresh Vegetables are always the best option but seasonal prices may affect your choices. When vegetable prices are high consider frozen vegetables. These are convenient and can be quickly heated up in the microwave. The health benefits of eating higher fiber food is the lowering of blood pressure, lowering cholesterol and helping to avoid constipation and inflammation in the digestive tract. Pre-prepare vegetables in your refrigerator and add them to your packed lunch and serve them before every meal. In our hectic, modern lives, many of us focus so heavily on work and family commitments that we never seem to have time for pure fun. When we carve out some leisure time, we’re more likely to mindlessly “zone out” in front of the TV or computer than engage in fun, rejuvenating play like we did as children.Play is beneficial for people of all ages. Play can add joy to life, relieve stress, supercharge learning, and connect you to others and the world around you. Greater benefits are gained when playing involves more than one other person, away from the sensory-overload of electronic gadgets. Game play can trigger the release of endorphins, the body’s natural feel-good brain chemicals. Endorphins promote an overall sense of well-being and can even temporarily relieve pain. Playing fun activities that challenge the brain can help prevent memory problems and improve brain function. The social interaction of playing with family and friends can help ward off stress and depression. 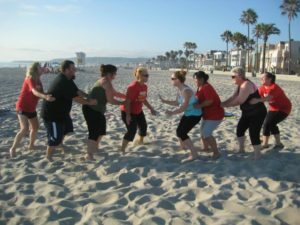 Participating in Mission Thin Possible encourages you to play regularly every week at least once and is usually looked forward to by team members. It’s possible that you are self-conscious and concerned about how you’ll look and sound to others when you attempt to play games if you have not regularly participated in physical games. Fearing rejection, embarrassment or ridicule when attempting to participate is an understandable fear especially if we are overweight. We design our games to encourage participation for all with more emphasis on fun than serious competition. Sharing laughter and fun fosters empathy, compassion, and trust. Our games can help you loosen up in stressful times, break the ice with strangers, make new friends, and form new lasting relationships. Keep you feeling young and energetic. In the words of George Bernard Shaw, “We don’t stop playing because we grow old; we grow old because we stop playing.” Playing boosts your vitality and even improves your resistance to disease, helping you feel confident and your best. Play is not just essential for kids; it is an important source of relaxation and stimulation for adults. Playing is a fun way to fuel your imagination, creativity, problem-solving abilities, and emotional well-being. Adult play is a time to forget about work and commitments. By participating in non-competitive game playing you can play with the joyful abandon of your childhood, and reap oodles of health benefits throughout life. Games that are multi dimensional provide most stimulation. They can stimulate your imagination, helping you to maintain your adaption and problem solving skills. Start thinking today and everyday how you can add “playtime” to your to-do list. See you at your next Team Game. Sleep serves to re-energize the body’s cells, clear waste from the brain, and improve learning and memory. Most of the sleeping we do is characterized by large, slow brain waves, relaxed muscles and slow, deep breathing, which help the brain and body to recuperate after a long day. Inadequate sleep causes a reduction in concentration and perception due to the brain not adequately benefiting from the restorative nature of sleep. An increasing number of us are chronically sleep deprived because of our modern lifestyles. If your sleep account is in deficit, it will affect your daytime energy, emotional balance, and your weight. Sleep plays a vital role in physical health, memory, emotional well-being and longevity. 8 hours of sleep is recommended for optimum health. Lack of sleep influences your digestive system, immune system, vitality and your weight. It affects your “famine response” hormones, it increases ghrelin and decreases Leptin, affecting your appetite, you are tired and start to crave higher calorie foods. A further affect on your body caused by lack of sleep is an increase in cortisol – the stress hormone which activates the reward centers in your brain that make you want food – and not the healthy foods we should be eating. Lack of sleep leaves you hungrier, less satisfied after meals and with no energy to exercise. The cure for sleep difficulties can often be found in your daily routine. Unhealthy choices during the day can result in restlessness at night. Try the following actions to help you achieve 8 hours sleep a night – including weekends. Work towards a natural sleep and wake cycle. Get enough sunlight during the day to stimulate the production of melatonin . 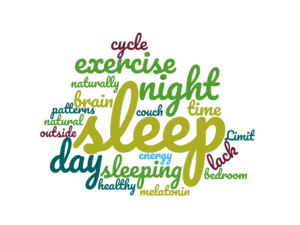 Melatonin is a naturally occurring hormone controlled by light exposure that helps regulate your sleep-wake cycle. Your brain secretes more melatonin when it’s dark—making you sleepy—and less when it’s light—making you more alert. Try to go to sleep and get up at the same time everyday. Choose a bedtime when you naturally feel tired. Avoid sleeping in on weekends if you need extra sleep at the weekend take a daytime nap but keep to the same wake up time. Limit naps to 15 to 20 mins in the early afternoon. Avoid sleeping after supper, if you feel drowsy get up off the couch and do some exercise or light household chores, do not sleep on the couch! Remove clutter, re-locate desks and work items, put clothing away, remove the TV, make the space condusive to sleep. Make your bedroom as dark as possible or use a sleep mask. Make sure its not too hot or too cold, adjust your bedding to ensure you are sleeping at a temperature that encourages sleep. Cut out the late night coffee , avoid alcohol before bed, that nightcap that you think is helping you relax is affecting your sleep cycle- stimulants disrupt sleep patterns. Avoid bright screens an hour before bedtime – ipads, cell phones, TV. Listen to music or a podcast instead. Some nights it is inevitable that we are not going to get enough sleep, the key is to make up for it on the following day and catch up on the lost sleep. If you are in a situation where you only get a few hours sleep a night consistently, start to make the changes that will give you the chance to get more hours of restorative sleep. Decide on a bedtime and wake-up time that works best for you. Spend some time each day outdoors in the sunshine. Replace caffeinated drinks after 5 pm with alternate non-caffeinated beverages.